How To Update The Linux Kernel Without Rebooting Using Uptrack [Ubuntu, Fedora]? It is a well known fact that you can install updates in Linux without rebooting, unlike in Windows. However, when it comes to Kernel Updates, you are required to re-boot your Linux systems too! Well, as they say there is a solution of every problem on this Planet, so is Uptrack for Linux! 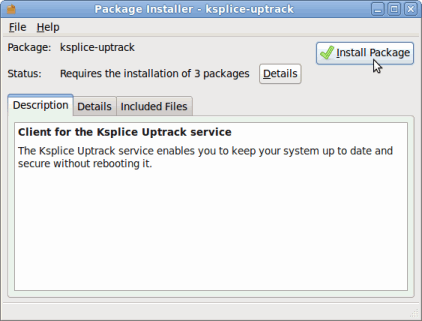 Ksplice Uptrack is a really cool technology which allows you to update the Linux Kernel without rebooting your computer. Ksplice Uptrack is available for various Linux distributions, but at a small monthly fee after a 30 day trial period.However, Ksplice recently announced that Uptrack would be available for free on Fedora! Uptrack is already free for Ubuntu Linux. In this article we will tell you how to Download, Update and Configure Uptrack on Ubuntu and Fedora systems. Uptrack currently supports the latest version of Fedora Linux - Fedora 13 Goddard. You can download Uptrack for Fedora 13 Goddard directly from this link: ksplice.com/uptrack/dist/fedora/13/ksplice-uptrack.rpm. Installation can be started by double clicking the downloaded RPM file. You will require to install some additional packages for the installation but the package manager will handle this for you. You have to accept the terms of condition in order to start the installation. Uptrack for Ubuntu is also available Free for the latest Ubuntu release - Ubuntu 10.04 Lucid Lynx. You can directly download it from this link: ksplice.com/uptrack/dist/lucid/ksplice-uptrack.deb. Uptrack is available for older Ubuntu releases too: Ubuntu 9.10 Karmic & Ubuntu 9.04 Jaunty. 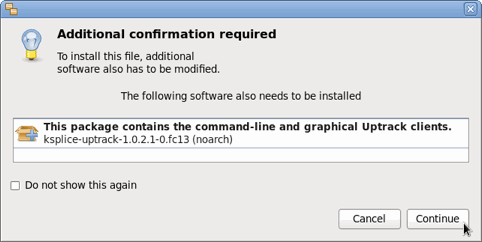 As with Fedora, in Ubuntu also you should start the installation by double clicking the downloaded DEB file. Once you do that, the GDebi Package Manager will take over the installation and you can see that 3 additional dependencies need to be satisfied. The package manager will handle this. After this, you need to accept the terms and conditions which are shown, for the installation to continue. 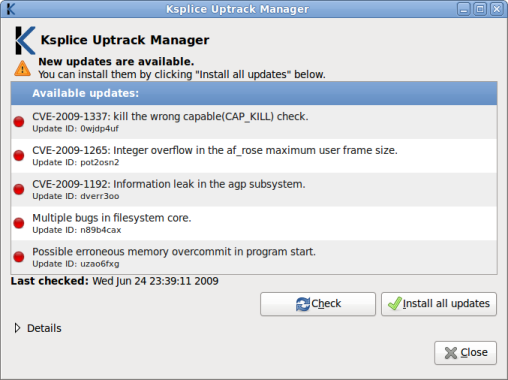 After installation completes, After you do so, the Ksplice Uptrack Manager will appear. It has all latest Kernel updates and the latest fixes to Linux ready to be installed, all without rebooting, as long as Fedora / Ubuntu publishes updates for a major kernel version. The Uptrack panel icon will notify you whenever new updates are available.